Dynamic estimation and control is a fast growing and widely researched field of study that lays the foundation for a new generation of technologies that can dynamically, adaptively and automatically stabilize power systems. 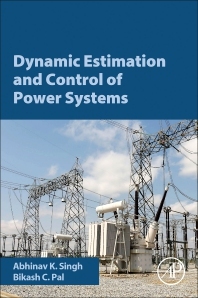 This book provides a comprehensive introduction to research techniques for real-time estimation and control of power systems. Dynamic Estimation and Control of Power Systems coherently and concisely explains key concepts in a step by step manner, beginning with the fundamentals and building up to the latest developments of the field. Each chapter features examples to illustrate the main ideas, and effective research tools are presented for signal processing-based estimation of the dynamic states and subsequent control, both centralized and decentralized, as well as linear and nonlinear. Detailed mathematical proofs are included for readers who desire a deeper technical understanding of the methods. This book is an ideal research reference for engineers and researchers working on monitoring and stability of modern grids, as well as postgraduate students studying these topics. It serves to deliver a clear understanding of the tools needed for estimation and control, while also acting as a basis for readers to further develop new and improved approaches in their own research. Dr. Abhinav Kumar Singh is a lecturer at the University of Lincoln and a Visiting Researcher at Imperial College London (ICL). He received his PhD from ICL in 2015. He is a recipient of the prestigious EPSRC Doctoral Prize Fellowship and IEEE Power and Energy Society Working Group Award for his contributions to power system modeling, estimation and control. Dr. Singh is a Member of IEEE and in this capacity has contributed to two Task Force reports, chaired sessions and presented tutorials. Dr. Bikash C. Pal is a professor of power systems at ICL. He has published approximately 80 IEEE Transactions papers and coauthored two books. Professor Pal is a Fellow of the IEEE for his contributions to power system stability and control and is Series Editor of Elsevier’s Sustainable Energies. He previously served as Editor-in-Chief for IEEE Transactions on Sustainable Energy and IET Generation, Transmission and Distribution.